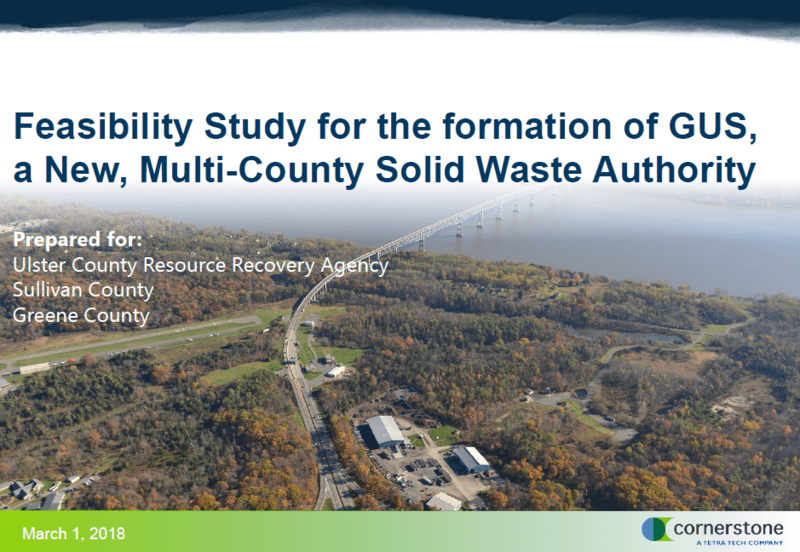 The Ulster County Resource Recovery Agency (UCRRA) has retained Cornerstone Engineering and Land Surveying, PLLC (Cornerstone) on the behalf of the counties of Greene, Ulster, and Sullivan for the preparation of an engineering feasibility study addressing the possible formation of a new Greene, Ulster and Sullivan (GUS) solid waste management authority. Formation of a new solid waste management authority is being considered with the goals of improving waste management operations, creating efficiencies among the three counties, and the potential for reduction of both long-haul truck miles and their associated greenhouse gas emissions. Currently each of the three counties has existing systems in place for the management of waste and recyclable materials. Formation of the new authority is predicated upon the expectation that the combination of the various county and UCRRA assets under one organization will facilitate a greater level of efficiency and provide a broader range of services than can currently be obtained through each county maintaining independent operations. Creating a three-county authority between Greene, Ulster, and Sullivan (GUS) creates a larger geographical area where synergies with logistics for local waste transportation can benefit outlying communities of one county to a possible closer disposal options of the adjoining county within the authority. collected for lower disposal fees, along with any and all recyclable materials collected within each county should result in a better position with recycling markets and all three counties will have access to Authority educational outreach programs. Additionally, in the absence of local disposal facilities, waste from all three counties is currently transported long distances for disposal. Together, the waste generated from all three counties creates the potential for facilities such as a local organics management or other means of disposal to be financially and environmentally viable.